One year ago, the Arizona Department of Transportation’s Enforcement and Compliance Division sent five of its officers to Mexico as part of 12-month program to educate Mexican truck drivers and mechanics concerning the safety regulations they must follow in order to operate their commercial equipment on U.S. roads. 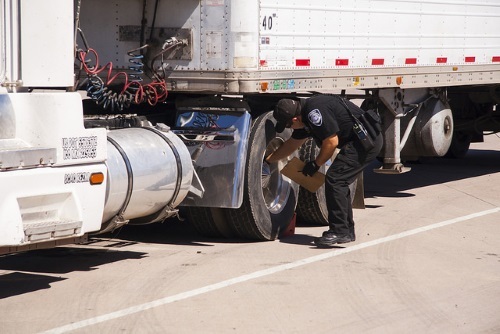 The agency said that those officers conducted 16 two-day training sessions over the last year via its new International Border Inspection Qualification program, teaching 409 Mexican truck drivers and mechanics things such as how to secure a load properly and how to know when tires and brakes are too badly worn along with other Commercial Vehicle Safety Alliance guidelines that are used by every state and federal agency in the United States. Drivers who completed the training and passed written and field exams were also able to communicate with inspectors using the WhatsApp smartphone application. That process has been used 118 times, the Arizona DOT said, allowing drivers to ask questions and make repairs before approaching the U.S. border, saving what could have been wasted waiting time. To date, the agency reported that the Mexican drivers trained via its program crossed the border 5,253 times over the last 12 months and only 11 times have their trucks been pulled out of service for significant safety concerns. They also received citations for 130 minor violations, the Arizona DOT added. The agency added that this June is one of three months so far in 2018 when no Mexican drivers qualified through the program were cited for any significant safety violations. The Arizona DOT also noted that it has scheduled six more training sessions in Mexico before the end of 2018. Of the six programs scheduled over the rest of 2018, only one is located near the Arizona border, noted Tim Lane, director of the Arizona DOT’s Enforcement and Compliance Division in a statement. By contrast, three of them scheduled in Mexicali, Baja California, with single sessions scheduled in Caborca and Hermosillo in Sonora. The program is also part of an effort to redirect more truck-based freight traffic from Mexico directly through Arizona; traffic that had previously gone through other ports of entry in Texas and California due in part to inspection delays.